A sink is an indispensable part of any kitchen. Just think about it. Where do you wash the dishes? Where do you wash your veggies? Where do you wash your hands while cooking? Think about how difficult your life would be without a sink; all that dirt, grime, and mess falling right down on your beautiful kitchen floor. But life can become just as difficult with a sink. I’m talking about a lousy sink, the kind that rusts, clogs prematurely, looks and feels cheap and stinks. So, to make sure you don’t go and buy yourself a bad sink, we’re featuring an excellent one. It’s the Karran QA-750, and it is one of the best kitchen sinks in the market today. Before we tell you why we like it, here’s a little bit about the product itself. Now that we’ve told you all about the Karran’s features, let’s get to the review. After installing and extensively testing the Karran for an extended period, we’re happy to report that this sink lives up to the reputation of its manufacturer and is worth every dime it commands. Here’s what we like about it. Would you look at those colors! The Karran is available in six color options, namely black, brown, concrete, grey, bisque, and white. 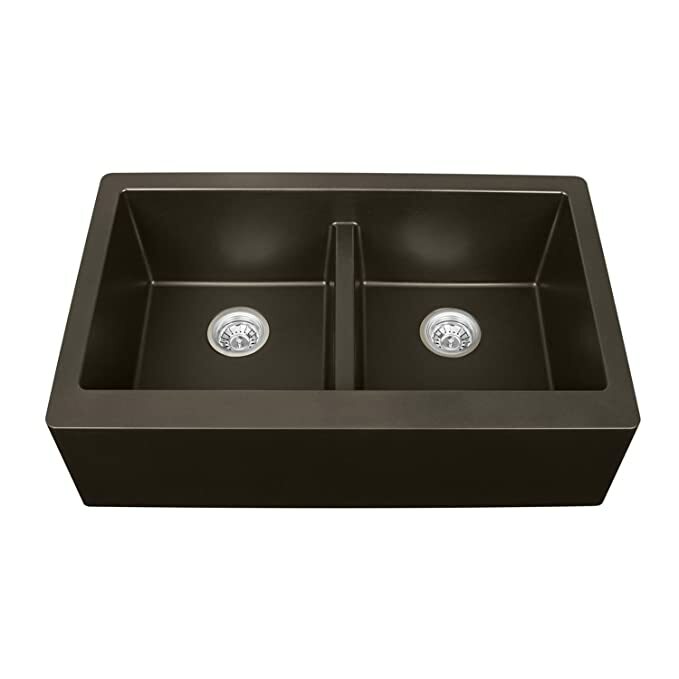 The model we tested had the brown color option, and we were taken aback by how beautiful the sink was. Under direct sunlight, it looked terrific, soaking those sun rays up. It wasn’t too lustrous (we believe the white color option will take care of shine), but that was not an issue, as it carried an air of understated elegance about it anyway. The quartz construction (more on that later) is complemented by pure acrylic resin, which helps the Karran get its beautiful finish. The Karran QA-750 is made of 80% natural quartz crystals and pure acrylic resin. This quartz and resin mix is the best combination to make kitchen sinks and is followed by all top-grade manufacturers. It is incredibly durable and resists temperatures up to 535° Fahrenheit, which means it can easily take the hottest water you can pour on it without fading. The quartz construction also means that the Karran is non-porous, preventing the spread of bacteria and germs as well as preventing food from sticking in the recesses. It’s also clear by now that the quartz surface makes it easy to clean as well. Further, the construction is very pleasing to touch, meaning if your hands do come in contact with the sink, instead of feeling disgusted, you’ll be pleased with the quality of the sink! The Karran features a double-bowl design with an apron in the middle. Both the bowls get their dedicated drains and are useful if you wish to, say, separate your dishes from your veggies. The sink as a whole measures 34” in length, 21-¼” in width and 9” in depth. Each of the bowls measures 14-¾” in length, 16-¾” in width and 9” in depth. The apron is 9-¼” deep. We found the proportions of the Karran to be well-judged. The bowls are deep enough to accommodate a decent number of dishes and prevent splashback but are not deep enough to make cleaning a back-bending inconvenience. The apron is tall enough to keep both sides well-separated and makes for a hassle-free cleaning experience. The rear drain location is a boon, meaning the water drains quickly and effectively without sticking for long or leaving any ugly marks on the sink. It also prevents the development of foul smells as the water drains quickly. If you’ve got an old sink that creates more problems than it fixes, then you should be in the market for a new one, and if you are, then you shouldn’t look further than the Karran QA-750. It’s well-built, comes in beautiful finishes and is a top-class product.